The question is, what should your routine look like? What level of exercise is right for you? How often and how long should you exercise each week? Now that you’ve made the decision to start, here are a few things to think about when creating your routine. Our first recommendation is to check with your physician. Your doctor will tell you whether or not you are fit to begin walking or running, and perhaps make recommendations on duration, frequency, and intensity. Always start here, especially if you are over 40 years old and live a mostly sedentary lifestyle. Most exercise routines start with a benchmark, and walking/running is no different. So start by going on a nice and easy walk once or twice around the block to gauge your current level of conditioning. Pay attention to things like heart rate, breathing, and perceived exertion. Bonus points if you make this your first entry in your workout journal. In terms of frequency, a good place to start is three times a week, 15-20 minutes per session. This goes for walking or running, and it gives you a good, attainable structure to hang your hat on. As your condition improves, so too can the frequency and duration of your sessions. This one is a no-brainer: the more you exercise, the more calories and hydration your body will need to operate. Make an investment in nutritious, colorful meals that include a lot of fruits, vegetables, and protein. Drink plenty of water throughout the day. You’ll be amazed at how your body responds when properly fueled and hydrated. If you begin to experience pain or discomfort, dial things back and give your body a chance to adjust. Overexertion can lead to injury. Some days, you might have a longer walk or run planned, but find that you’re reaching your limit only halfway through. It’s okay to adjust your routine from time to time. If you’re not feeling it one day, or you’re under the weather, shorten your exercise or skip it completely. Don’t overlook this important step (pun intended!). Although your old pair of walking shoes might not make a noticeable impact at first, over time, they may begin to affect your gait and cause imbalances that can cause pain or even injury. Since you’ve already decided to invest in yourself by starting this routine, set aside some money and invest in a decent pair of running shoes, too. 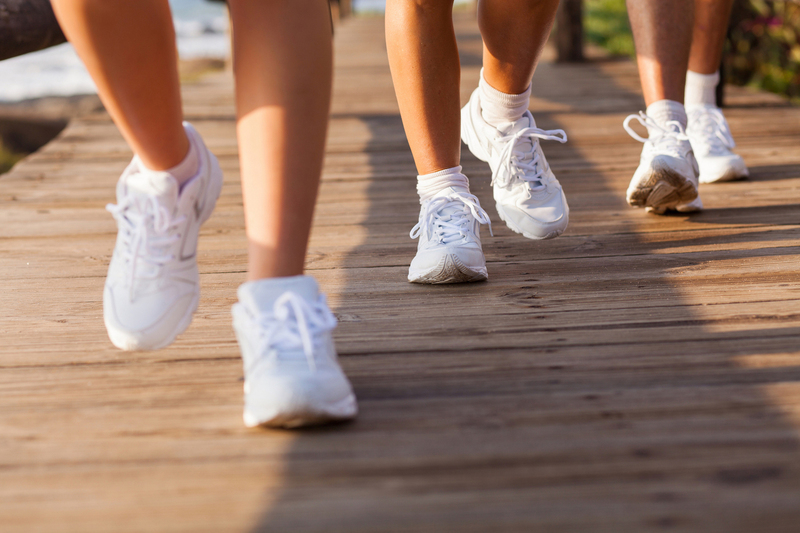 Running and walking groups are great ways to stay motivated and enhance your routine. Being around other like minded people help you stay accountable, motivated, and have fun doing it. There are groups like these in nearly every city—just Google it or find a local MeetUp! When it comes to reaching that next level in your routine, don’t be discouraged if progress is slow. Often, it takes a couple weeks to ease into your new routine and adjust to the physical exertion. Even if you remain consistent, you might experience plateaus in your time, conditioning, or weight loss goals. Don’t be discouraged! Keep taking small, consistent steps, and you’ll be soon look back with surprise at the amazing progress you’ve made. And finally: keep going! The more consistent you are with your routine, the more progress you will make. Soon, you’ll have built a routine you can depend on—one you know, inside and out. With a a little bit of focus in the areas above, you’ll have all you need to lay the groundwork.